Were she better able to express her emotions, my two-year-old daughter, Georgia, would probably say that it’s no picnic being the youngest of three girls. Sure, there’s lots of love, always someone to help you choose an appropriate pink-and-purple outfit. But you’re the lowest on the pecking order, someone’s always bossing you around, and when it comes to verbal humor, your language skills put you behind the joke for a long time. For days, Georgia’s big sisters walked around saying, “With God, all things are popsicle!” and collapsing in giggles. I laughed too, but I also wondered if Georgia was on to something. This wouldn’t be the first time a child unwittingly enlightened me in spiritual matters. Does God have anything in common with a frozen dessert? I think so. And I don’t mean catchy platitudes, like: Everything’s cool with God! or God’s always so refreshing! The thing about popsicles is that the idea of them is much simpler than the reality. 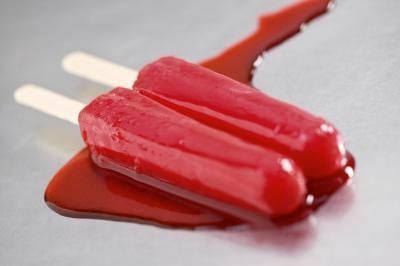 Most of us choose a popsicle when we need relief, something light and portable to cool us down. They seem like a quick and easy fix. So on those brutally hot summer days that we get in Vermont — when the windows are open and the fans are going, when the stifling air is filled with the smell of cow manure, when all you want is to sit in the wading pool (if it weren’t for the mosquitoes) — on THOSE days, I make popsicles as a treat for my girls. And right away the squabbling starts. Our popsicle mold came with four differently colored plastic sticks. So before any licking begins, the girls fight for five minutes over who gets which color. There’s a reason why I only make popsicles in the summer: it’s so I can put each one in a bowl, hand each bowl to a daughter, and immediately send each daughter outside. Because popsicles are messy. Whether you’re 2 or 102, that popsicle will melt all over you. Sure, you’ll get some sweet relief from the heat, but you’ll be left with sticky hands and embarrassing drip stains down your front. Everything. As with popsicles, there’s a difference between my idea of God and the reality. When I was a kid, God seemed like a quick and easy fix: say a prayer and go to heaven, and in between be really good! I wasn’t big on messes then, either literal or spiritual. LIFE IS MESSY. It’s messy whether or not you’re trying to experience God, but God is certainly not a “quick and easy fix.” It sometimes feels like the closer I am to God, the messier things get. People I love are sick and sad, senseless things happen, and there’s no way I can be “really good” — I’m the biggest mess of all. I’m walking through life with sticky hands and embarrassing drip stains down my front. Even people who love God squabble over silly things — the equivalent of fighting over the color of your popsicle stick when the popsicles are all the same. Honestly, I rarely think about heaven anymore; there’s way too much to deal with right here. So why bother with God — or popsicles? Well, I’ve also learned that you can’t get to the joy without the mess. You can go through life avoiding popsicles, sidestepping sick and sad people, obsessively washing your hands and scrubbing your clothes — but where’s the joy in that? Popsicles — and God — may not be quick and easy fixes, but sometimes they’re the only thing that brings relief, and through the mess there’s incredible joy to be had. I hope that one day, Georgia herself will find that with God, all things are popsicle. This entry was posted in Adversity, Parenting, Theology & Philosophy. Bookmark the permalink.